Commodity trading has been the epicenter of economic growth for thousands of years, dating back to 4,500 BCE. In the civilization known as Sumer, citizens would use clay tokens sealed in a clay vessel as a medium of exchange for goats. Clay writing tablets indicated the number of clay tokens inside each sealed vessel, and the merchant would deliver the specified number of goats. Inscribed on the tokens were specific, dates, times and amounts to be traded; indicating the first known commodity futures contract. A commodity is any raw or primary agricultural product that is standardized: has an unvarying price in the global market, and helps make other products. For example, the cost of oil per barrel on any given day (ex: $50.13) is the same cost around the world. Commodities fall under four main categories: energy, metals, livestock and meat, and agricultural. These four categories can also be organized as soft (grown), or hard (mined) commodities. Commodities of the same grade are considered interchangeable. For example, certain rare ores such as diamonds do not qualify as exchangeable commodities because each rock differs in shape, purity, quality, and size. Energy commodities include all types of energy that can be used to provide heat or power to industrial or residential activities. Crude oil, coal, and gasoline are the main components from which other energy commodities are derived from. This includes heating oil, electricity, propane, ethanol, and natural gas. Due to the essential role these resources play in our daily lives, they are among the most heavily traded commodities in terms of price and volume. Crude oil is the world’s most actively traded commodity: although prices are affected by international policies, political instability, and organizations such as the Organization of the Petroleum Exporting Countries (OPEC), crude oil prices are mainly determined by global supply and demand. If the demand for oil is high, and the supply is low, oil prices will rise. Within the last five decades we have experienced drastic booms and busts in oil prices. For the most part, these rapid changes in crude oil prices can be attributed to global military and political conflicts and natural disasters. Although natural gas was once considered a useless by-product of oil exploration, it is gaining importance due to its numerous benefits and practicality. Economical, environmentally friendly and efficient, natural gas is the cleanest-burning fossil fuel, and technologies are improving the way it is captured, transported and distributed. Unlike oil, natural gas is not traded worldwide. Its price is mostly determined by long-term contracts that vary from region to region. Natural gas prices are mainly determined by demand and supply, but its dependency seasonal changes, and elevated storing costs cause prices to experience rapid changes in a short period of time. Coal is the most widely used and cheapest source to generate electricity; it is responsible for about 50% of the world’s electricity consumption. However, due to its minute cost (about 1/5 of other fuels), coal prices are not volatile and it does not significantly impact the price of electricity on the grid. Along with being the cheapest, coal is also the most environmentally unfriendly fuel source and the single largest source of air pollution in the world. Coal prices are mainly affected by the demand of oil and natural gas. If oil and natural gas prices rise, coal prices will decrease, resulting in an increase in quantity demanded for coal, and eventually an increase in price. There are two main types of metals: industrial and precious metals. Their names provide a brief description of the purpose they serve. Industrial metals include aluminum, nickel, steel, zinc, copper, lead, titanium, etc. These goods are most commonly used in manufacturing as production inputs and are strongly correlated with the stock market. When demand for raw materials climbs, the pulse of the global economy quickens. In addition, increases in metal prices often trickle down through the products in which they are used, making this asset class a potentially effective tool for combating inflation. Precious metals are deemed to have intrinsic and economic value; some have been used as currency, and are valued because on their rarity, uses in industrial processes, and as investment opportunities. Precious metals include gold, platinum, rhodium, ruthenium, palladium, silver, etc. Buying precious metals such as gold and silver offer a unique way of protecting yourself against the perils of inflation and a boom and bust economy. For example, when there is political instability, or the general economy and financial institutions are perceived as unstable, hoarding gold has been used as a method of financial security. Usually strong U.S. dollar drives gold prices down, investors’ trade in dollars when currency is strong, but prefer gold when the dollar is weak and the economy is uncertain Usually, when equities, bonds, and real estate prices fall, gold rises and can used as a hedge against inflation, deflation, and currency devaluation. On the other hand, silvers’ worth does not mainly come from its intrinsic value, but rather for its role as an industrial component. For this reason, silver is highly volatile and experience drastic price changes in the silver market. Livestock falls under two main categories: feeder and live. Cows fall under the “live” category from the moment they are born until they reach a weight of about 700 pounds. They are then transferred to “feeder lots” where they are fed a myriad of grains that promote rapid weight gain. Cattle’s prices are mainly influenced by three main factors: mad cow disease, national health trends, health of the overall economy, and prices of cattle feed products such as corn, soybeans, and wheat. 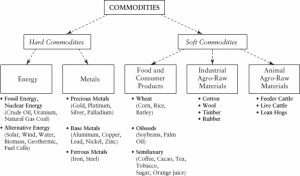 Agricultural commodities are classified under soft commodities: coming directly or as byproducts of crops and/or animals. Corn, oats, rice, soybeans, orange juice, chicken, wine, beef, cotton, wheat, and walnuts, etc. All constitute as agricultural commodities. The U.S. top commodity export in 2015 was soybeans: with a value of over $18 billion, followed by corn with an export value of $8.2 billion. They are usually traded in options and futures markets near the region where most of the product is grown. 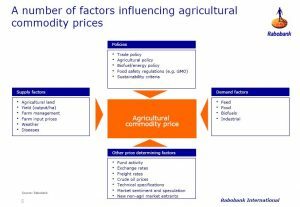 Factors affecting Agricultural commodity prices differ greatly from metals and oil because they are capital-intensive products, are perishable, and as a result are directly affected by weather conditions, labor patterns, and technology. There are four main factors influencing commodity prices: production associated issues, shipping and storage, global economic patterns, and seasonality. Occurs when there are not sufficient features or components to meaningfully differentiate one product or substance from another. Often, the only differentiating aspect of one commoditized product to another is price. Fear of commoditization often results in innovation: as companies aim to distinguish their products from competitors in order to increase marginal revenue. From a consumer’s point of view, manufacturer’s fear of commoditization promotes competition, resulting in improved quality of goods and decreased prices for consumer. How futures markets affect prices- As you can imagine, commodity prices are exceptionally volatile, and are affected by many factors ranging from natural disasters and wide-spread disease, to financial and political uncertainty. In an attempt to hedge against abrupt price changes, Chicago farmers founded the Chicago Board of Trade (CBOT) in 1848; establishing the first exchange for commodities futures trading. Futures markets are used to avoid price volatility within a specific sector or industry. Essentially, futures contracts are used to lock in a specific price for a specified amount of goods and are to be executed at a specific date. Investors essentially wager on whether a price of a good will increase or decrease. If the price of a specific good goes below the specified amount, the investor pays the difference, but if the price rises above the predetermined amount, the investor earns a profit. These contracts transfer potential risks and rewards from the producer or business owner to the investor. As pictured, commodities experience drastic booms followed by deep busts. Futures trading aims to keep these drastic fluctuations within acceptable margins. Commodity exports and futures contracts are perhaps some of the most lucrative and perilous markets to trade in. The promise of making hundreds of thousands of dollars while only risking 5 to 20 percent of the total contract value might seem enticing, but do not be fooled. Commodities trade on futures markets, giving investors an elevated degree of leverage. In the futures market, leverage refers to having control over large cash amounts of commodities with comparatively small levels of capital. Is it possible to earn money in the commodities market? Yes, but, the daily volatility of currencies tends to be lower than 10% while the same metric for a commodity like natural gas tends to be above 30%. Commodities are risky assets Raw material prices have been known to double, triple, or half within a single day, classifying commodities among the riskiest, most volatile exports.